Here we are, in the wake of the Bulls’ game 1 victory in the 2012 playoffs. Yet the mood not what you would expect with not much excitement but rather disappointment. Any Bulls fan would ask themselves why now? Why us? Why him? Could it have been the hurried season? The coach? You can’t point the finger. The sad truth is that it’s sports. It happens. Anytime anyone plays a sport there is always a risk of injury big and small. So it happened, and all we can do is move forward right? Right. I arrived at work a little earlier than usual to catch a glimpse of the game. As i walked into the lunchroom of my workplace the first thing i noticed was the score, then the time left in the game. Excitement filled the room in anticipation of a game 1 victory. Seconds later, the first play i seen was Derrick Rose dribble down the lane, cross over to the right, take a hop step, go up then pass to Boozer, then disappear from the screen. I noticed he fell as the play continued, when the camera went back to him, he was grabbing his left knee. Now, I’m not a doctor but if you play sports enough to notice the difference between certain injuries you kind of notice things before other people do. As my gut was telling me that from the pain Rose was in and the limited movement he showed holding on to his knee that it could’ve been a sprain but looked more like ACL issue. The words that came out of my mouth seconds later “he’s done” were more instinct than anything. I’ve seen the injury over and over and over amongst friends and colleagues while playing. It was similar to the scene in Friday Night Lights where the same injury occured to star running back Boobie Miles only this was happening in real time and the real world. It’s an injury that takes significant time to heal not to mention the rehabilitation process. When you notice the crowd get so quiet as you see the superstar of your home team you can’t help but to feel distraught. The seconds ticked away as the Bulls won but all the hearts that dropped after what they witnessed were still in shock. There was a coworker who shall remain nameless, who didn’t think much of the injury. In her words it was “all for promotion, all for hype, to sell tickets just like they do in boxing.” Try to explain that as i told her “sorry girl this isn’t Basketball Wives or some type of reality show.” But she insisted that it was fake and Derrick would sit out and play the following game. Well, there you go naive one, you tell us when Derrick Rose will be ready to go again. Coming off and MVP season last year, Rose had his share of injuries throughout this season that had sidelined him for a significant amount of time. The rest of the Bulls team however did anything but roll over and play dead. They managed to find ways to win 18 games without Rose in the lineup and it proved to the rest of the league that Chicago could continue without its leader. Some fans are writing off Rose saying he’s injury prone, but when statements like that are made you have to take into consideration that is a scrunched up 66 games season. There have been a lot of major injuries suffered by key players on legitimate teams. This isn’t NBA Live without the injury setting set to off. The human body does take a toll day in and day out and Derrick had one speed and one speed only and that was go hard or go home. We supported that mentality and it has brought us this far. Recovering from one injury and suffering an additional one after another after another is not uncommon. It happens to the all the greats and when it does it’s hard to watch but how can you write off a fierce competitor like Rose. Rose has already accomplished so much in his early career trying to be the best at what he does. He has overcome multiple obstacles and rarely with a smile. His humbleness sets him apart from the other superstars in the league. He represents the hardships Chicagoans go through. We were him, we were that kid on the playground wearing our Jordans, counting down the last five seconds as we dribbled for the last shot wearing a Bulls jersey. We were the ones that hit that swish as we jumped up and down raising our hands in the air looking at the Chicago skyline. We heard the crowd go wild cheering our name even if we made the crowd noise ourselves. What do we owe this 23 year old from Englewood that is living all of OUR childhood dream? After all, it’s just a game right? Anywhere else it might be. I know i don’t speak for myself that in Chicago it’s more than a sport. It’s a dedication, a passion that runs through our veins, it’s what we breathe. We were here in the glory days of Michael and Scottie running the show. We were also here through the hardships of the Baby Bulls in the early 2000’s. As I looked on in 2008 with a dear friend of mine Bobby Stewart we watched David Stern announce Derrick’s name as the Bulls No.1 pick and we felt as if a weight had been lifted off the city’s shoulders. So when we see one of ours go down the way that Derrick did, it hurts. The timing hurts even more, but who’s to say the Bulls are done. Certainly not the dedicated fans, we had the best regular season record for a reason with Derrick or without. Rose will miss the Olympics which he was looking forward to but now it’s about getting back period considering the rehabilitation process will carry into next season. It’s all about how he heals and reacts. He will have to adjust his game especially since he plays with such explosiveness. This type of ligament tear happens often and considering he has to regain strength and motion in his left leg the timetable is uncertain. It certainly puts a damper on the whole playoff picture. You want to go against the best to ultimately prove who the best is. More importantly this playoff run is supposed to be the one to put us over the hump like it did with the Bad Boys from Detroit and Riley’s Knicks. Although the Bulls have a major piece missing they have put together other right pieces in place to still contend for the title. The Bench Mob has to live up to its name, after all it’s playoff time and this is what they have been preparing for all season. Tom Thibedau has established a plan that is lethal when it operates correctly. It has made skeptics into believers over time and this will be the ultimate test. Everyone has to be on the same page, the focus is quite clear. 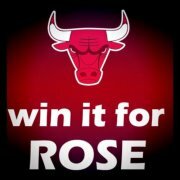 Not having Rose is a terrible blow that is a fact, but the Bulls have learned not to panic. They have equipped themselves with poise and versatility and not having Rose play during his injuries has prepared them for whatever comes their way and what it takes to overcome it.